As you all know, in baseball land, everything starts with the pitcher. Until that first pitch is thrown, you might as well be having a tea party, because nothing else is going to happen. There are two types of pitchers, a lefty and a righty. 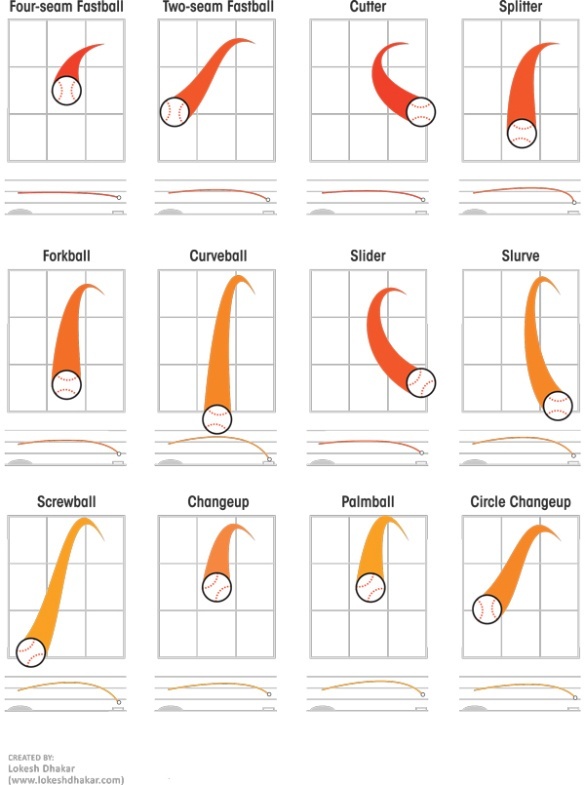 And in the scope of things, lefties have better success against left-handed hitters, and rightys have better success with right-handed hitters. There's a reason for this, and that's what the pitching advantage is all about. In the simplest of terms, when a pitcher throws a pitch at a batter, they want it to break over home plate. Which means that when a righty throws at a right handed batter, ideally, the ball will break away to the pitchers left, and go over the plate. Throwing at the center of the plate with proficiency, means that the ball breaks to the pitchers left off the outside corner. You see where I am going with this? Now, from the batters point of view, if the pitch breaks correctly, the pitch is always going away from them. That makes the batter slightly lunge for the ball, and it either turns into a strike when they miss or a weak grounder when they connect. No batter can get any power off the lumber when they are lunging for a pitch. This same principle applies when a lefty faces a lefty. The ball always breaks away from the batter, so the batter is always in a defensive situation. Of course, the opposite is true when a righty faces a left handed hitter. When a ball breaks in this situation, it is breaking towards the batter. So instead of lunging for a ball, a potential pitch from a righty to a left handed batter makes it easier to hit, as the pitch is coming towards the batter and not going away from them. And any contact with the ball gets it into the field and potentially into the gap between first and second base. Worse, a ball could break towards the batter and end up in their wheelhouse. And when that happens, say hello to a dinger. The proof is in the pudding though. Over the last 10 years, right handed pitchers held right handed batters to a .251 average while left handed batters were hitting .268. That's a 17 percent difference, and if you play the numbers, you've got to keep that in your noggin for consideration and get with the program here. First of all, there doesn't have to be an answer. No matter what, there are predominantly more right handed batters and right handed pitchers playing ball. In this case, the most effective pitching style will always be facing the least effective batter. On the opposite hand, if your opponent has a predominantly left handed hitting corps, you can start a lefty pitcher. That's a simple fix that gets the odds back in your favor. The reality is that, if you have a good pitcher, they should be effective dealing with batters on either sides of the plate. Still, there are other things to consider as well. When the opposing team sends up their big-time left-handed slugger, and it's late in the game with a tie score, go to the pen and pull out a lefty reliever. You are playing the odds here, and although doing this is no guarantee of success, if you play the numbers game consistently, you'll have consistent success. Of course, lets put the cards on the table. If your pitchers can't pitch, than there is no pitching advantage. Lefty, righty, it doesn't mattery. Which is why developing a pitcher needs to begin early. A raw pitcher that has nothing but a fastball isn't going to go very far. You can only blow it by so many people before somebody makes contact. But a pitcher that can make their ball break over the plate is where it's at. When it comes right down to it, as the old axiom goes, good pitching will beat good hitting every time. Good pitching, at any level, from Little League all the way up to the Bigs, will give you an advantage in every game, regardless of where the batter stands at the plate. Hey, numbers don't lie, and neither will a killer breaking pitch going away from the batter, no matter what side they hit from.